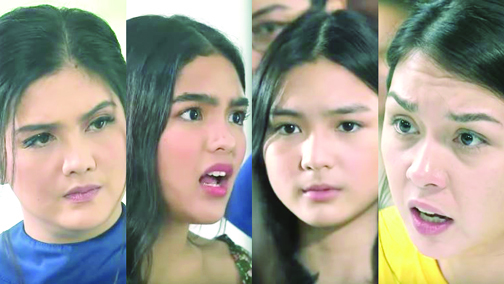 Viewers nationwide cannot get enough of the feisty catfights and fierce confrontations in Kadenang Ginto as it recorded a new all-time high national TV rating on Monday, March 18. The trending Kapamilya series hit a national TV rating of 23.5 percent, or almost double of its rival show Inagaw ang Bituin that only got 12 percent, according to data from Kantar Media. It was an emotional and gripping Monday for viewers as the episode showed Daniela (Dimples Romana) slapping her young stepsister Cassie (Francine Diaz) after a heated encounter. But with the bruises inflicted on her after their bout, Cassie finally had the courage to fight for her right to stay in their mansion by reporting her sister to the police. While Cassie is struggling in the hands of her sister and niece Marga (Andrea Brillantes), her mother Romina (Beauty Gonzales) is also hopeful that she could get out of jail because of the possibility that the court might grant her the petition to post bail. But Daniela will do everything in her will to prevent Romina from living the life she once had and make sure she rots in jail. Until when will Cassie and Romina take all the beating from their nemesis Daniela and Marga? Kadenang Ginto airs on Kapamilya Gold on ABS-CBN and ABS-CBN HD (SkyCable ch 167).